After 36 years of service and leadership, Alloway’s owner and former President, John Hoffman, will be transitioning to the role of Chief Executive Officer. After earning his Bachelor of Arts in Microbiology and Chemistry from Miami University, John Hoffman started his career at Alloway in 1981 as the sole laboratory analyst for the company. A year later, John purchased the company and expanded the operation to include a total of 3 employees. 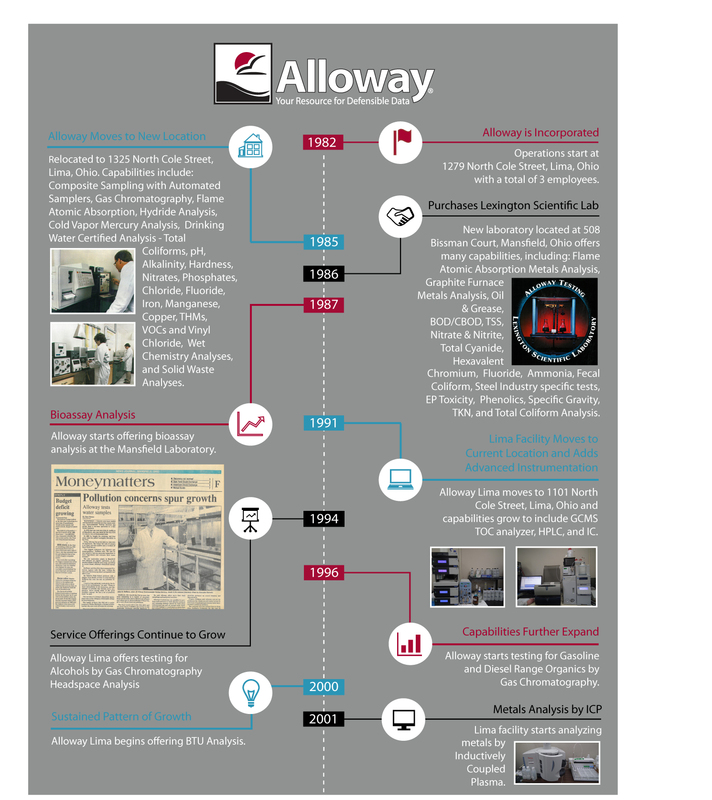 Under John’s leadership, Alloway continued to grow in size and analytical capabilities. In 1986, Alloway purchased Lexington Scientific Lab in Mansfield, Ohio. Alloway’s analytical capabilities continued to grow and 1987, Alloway started offering bioassay analysis out of the Mansfield laboratory. In 1991, Alloway’s Lima laboratory was moved to its current location at 1101 N. Cole St. and with the move, the analytical capabilities continued to grow to include Gas Chromatography Mass Spectroscopy, High Pressure Liquid Chromatography, and Ion Chromatography. In 2006, John oversaw the purchase of Aqua Tech Environmental Laboratory in Marion, Ohio. This allowed Alloway to enter the drinking water market for Ohio and offer testing services certified by the National Environmental Laboratory Accreditation Program. 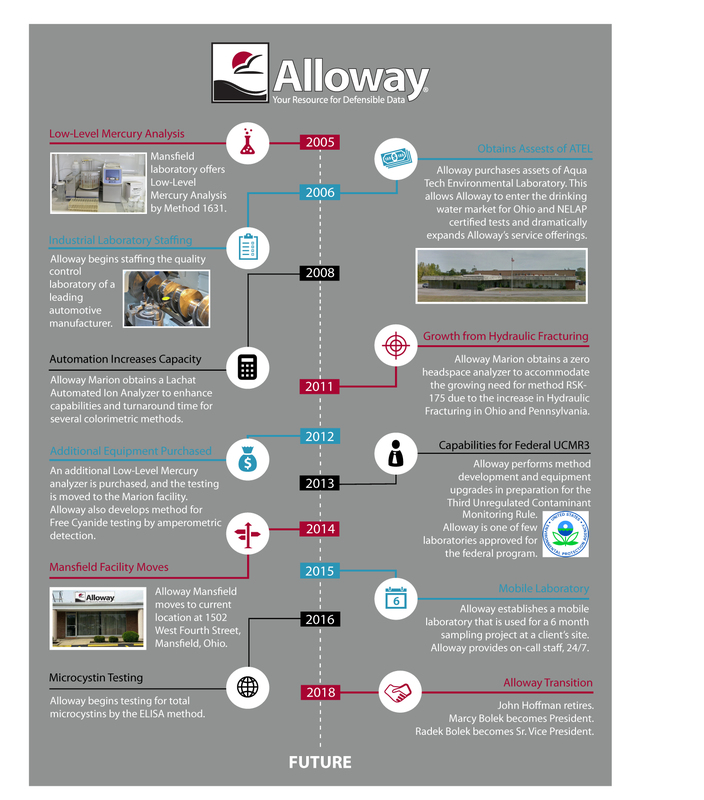 Throughout the years, Alloway has grown to include three locations and over 70 employees. In addition to achieving significant growth for Alloway and its service offerings, over the years, John has continued to pursue education and personal achievements. After traveling the world through Miami University’s Earth Expedition Programs, John earned his Master of Arts in Zoology in 2014. John is a member of various professional organizations, including the Water Environmental Federation, the American Society for Microbiology, American Water Works Association, the Crystal Crucible, and 5S. His career and leadership at Alloway has had a profound impact on the environmental testing industry. In John Hoffman’s transition to Chief Executive Officer, Marcy Bolek will be taking on the role of Alloway’s President. To learn more about Marcy Bolek and her career at Alloway, read our latest news item Marcy Bolek is Promoted to President.